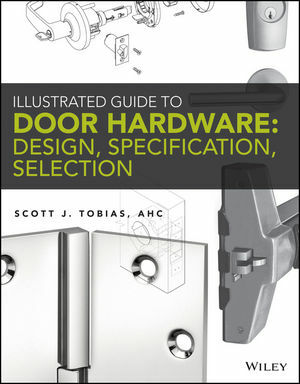 The Illustrated Guide to Door Hardware is the industry's one-stop reference for door standards, and the ideal reference guide for the Door and Hardware Institute's certification exams. A consolidation of all door and hardware standards and guidelines, this book eliminates the endless searching and guesswork that comes along with designing, specifying, creating, and reviewing submittals for door openings. Coverage includes physical and aesthetic aspects, local fire and accessibility codes, security considerations, hardware requirements, and much more. Each chapter focuses on a component of the door or opening, outlines all available options, and then gives you all the information you need to make the appropriate choices for your project. Clearly illustrated and consistently organized, the Illustrated Guide to Door Hardware is an invaluable architectural reference. Scott Tobias, AHC, CDC, CDT, CSI, CFDI, FDAI, LEED AP, has been servicing the door, hardware, and construction industries for over 25 years. Having served on the board of DHI as well as CSI, he is one of the most knowledgeable leaders in door hardware applications, code references, and specifications. As an expert educator in the architectural, design, and construction communities, he has authored numerous articles for the Construction Specifier magazine, Cleaning & Maintenance magazine, Life Safety Digest, and Door and Hardware magazine.